A century after Queen Victoria's death, debate still rages surrounding her relationship with her gillie, John Brown. Were they ever married? What was the extraordinary hold he had over her? This biography aims to shed new light on these questions and to discover the truth behind Brown's hold on his royal employer. Following the death of Prince Albert in 1861, the Queen found solace in the companionship of John Brown, who had commenced his royal employment as a stable hand. He became "The Queen's Highland Servant" in 1865 and rose to be the most influential member of the Scottish Royal Household. While the Queen could be brusque and petulant with her servants, family and minsters, she submitted to Brown's fussy organisation of her domestic life, his bullying and familiarity without a murmur. Despite warnings of his unpopularity with her subjects by one Prime Minister, the Queen was adamant that Brown would not be sacked. The Queen's confidence was rewarded when Brown saved her from an assassination attempt, after which he was vaunted as a public hero. The author reveals the names of republicans and disaffected courtiers who related gossip about Queen Victoria and John Brown and their purported marriage and child, and identifies those who plotted to have Brown dismissed. Based on research in public,. 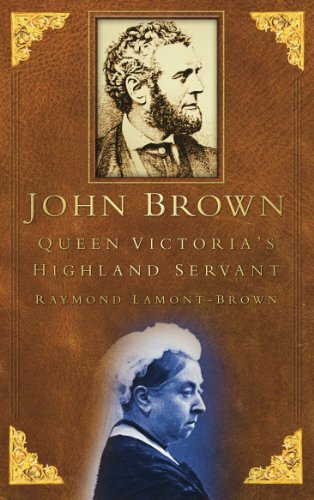 private and royal archives, as well as diaries and memoirs of those who knew Brown and interviews with his surviving relatives, this text analyses the relationship between Queen Victorian and Brown.